Google suggests using Google Chrome or Firefox Browser to experience Gmail twice as fast.�If you open the�Gmail website in Internet Explorer, you�ll see a link at the top that says "Get Faster Gmail" - it�s placed next to your Gmail user name and highlighted in bold red so you won�t miss it for sure. 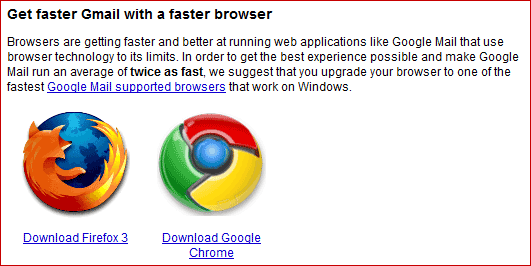 Google has been advertising Chrome aggressively across all their web properties but what surprised me here was this bit - "In order to get the best experience possible and make Google Mail run an average of twice as fast, we suggest that you upgrade your browser to one of the fastest Google Mail supported browsers that work on Windows." Is the Gmail website really that fast on Chrome or is this just an indirection promotion of Google Chrome for IE users? The message is displayed only inside Gmail and not in Google Docs, Google Maps or Google Calendar though these services too use "browser technology to its limits". Thoughts? Also see: Running Out of Space on Gmail?